Buying a wedding ring when you have skinny fingers and big knuckles. If you’re one of those people who have skinny fingers and big knuckles, it may be tricky when it comes to buying your wedding ring. Many of our clients with big knuckles opt for a wedding ring that slides over the knuckle. Unfortunately, once over the knuckle, the wedding ring feels loose. As a result, trying a smaller wedding ring results in inflaming the knuckle. This is especially true when trying on different wedding ring styles. Why do some people have skinny fingers and big knuckles? Some clients have naturally larger knuckles than others. One client referred to her fingers as strings with big knots! Sadly, some people suffer a large knuckle on account of an injury to the finger. A broken knuckle often remains larger than the rest. 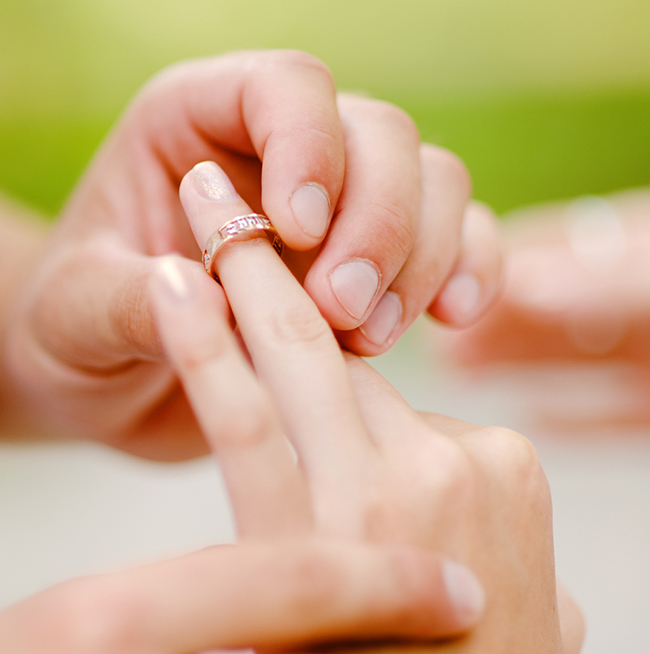 In the UK, Wedding rings typically sit on the left hand. The wedding ring is placed on the third finger (next to your smallest finger.) In addition, the wedding ring typically goes on first, ahead of the engagement ring. A simple solution few people think of involves wearing your wedding ring on the other hand. If your wedding ring finger on the left hand was broken, consider wearing the wedding ring on your opposite hand. In this situation, comfort becomes more important than tradition. With a little hand cream applied to the finger, choose a wedding ring size that feels slightly tight over the knuckle. Once over the knuckle, it may feel a little loose, but it will be secure on the finger without the risk of falling off. Special circumstances require different solutions. If your knuckle is large owing to Arthritis, or from a past injury, we have other suggestions. 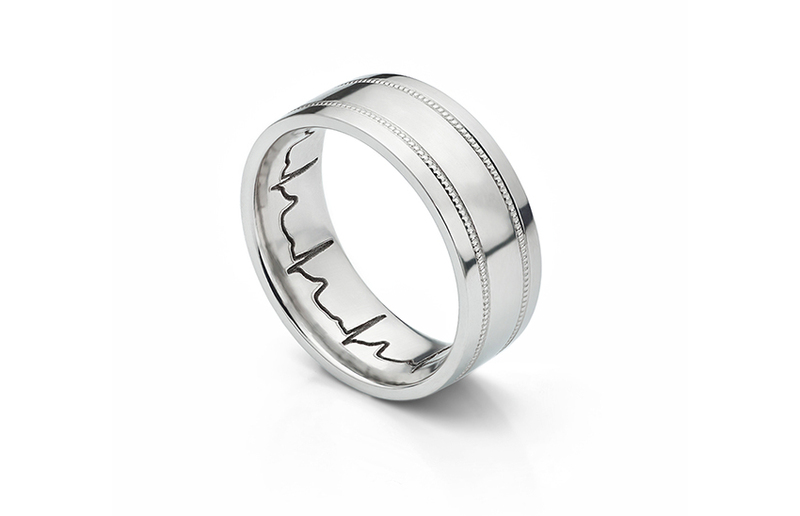 One solution involves soldering small bars or pips onto the inside of a slightly larger wedding band. The additional pips grip the finger once over the knuckle. This method often requires modification to get the size of the pips just right. 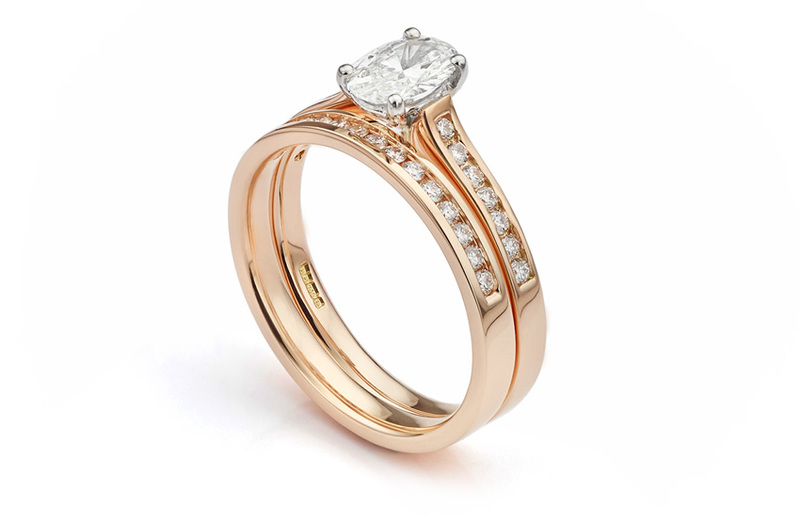 We recommend a pronounced court shape on the inside of your wedding ring. The court shape features a rounded surface. This glides over the knuckle easier than a flat interior surface. Ask us about suitable styles with a court or comfort fit. A slim band with a comfort fit fits easier onto a finger with a larger knuckle. 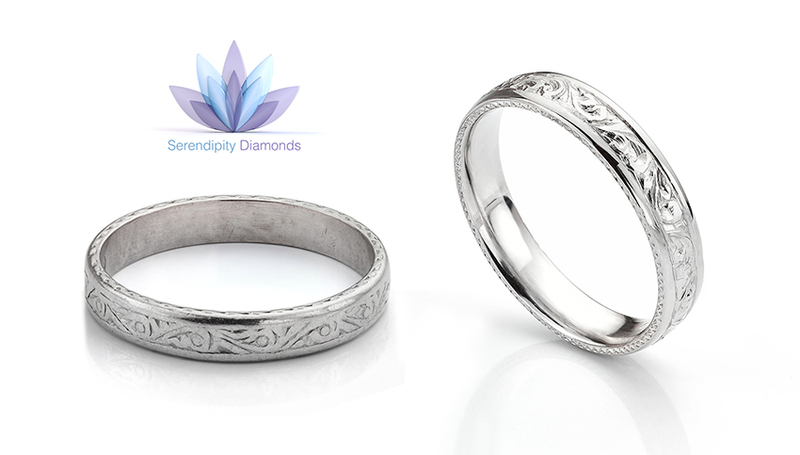 Design shown ‘Faith’ with a matching diamond wedding ring. Does width affect the fit of a wedding ring? Wider wedding bands fit tighter on the finger. A slim band in the same finger size lies against less flesh. As a result, a slim wedding ring feels looser. Finger flesh bunches around a slim finger. In contrast, a wide band forces skin under the ring. Factor in a sharp or flat edge with a wide band and the fit can be uncomfortably tight. 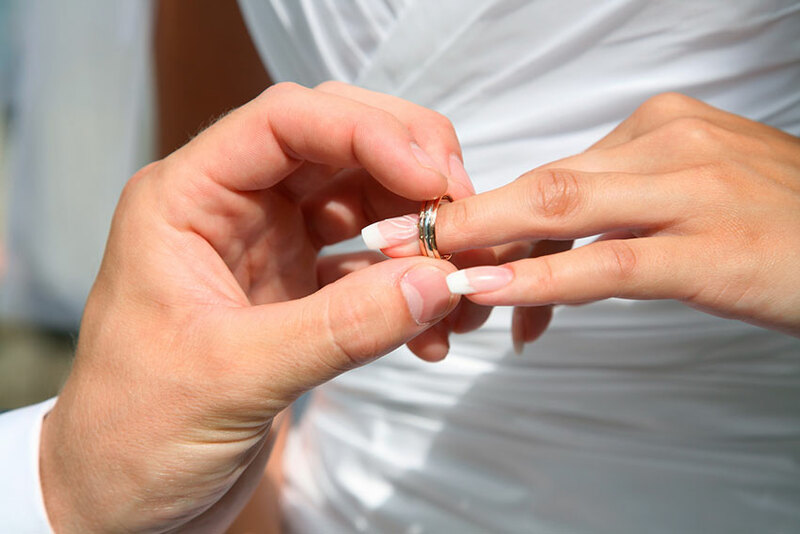 If you choose a wide wedding ring, make sure it has a comfort fit which glides onto the finger easier. Another option involves adapting a ring with a hinge and catch. Rather than going over the knuckle, it fits around the finger and locks. There are several companies offering this service such as Cliq jewelry in the USA. Not necessarily on account of swollen knuckles, but influenced by design, we sometimes craft wedding rings with a split band. This solution may lend itself to situations where a client has an enlarged knuckle. 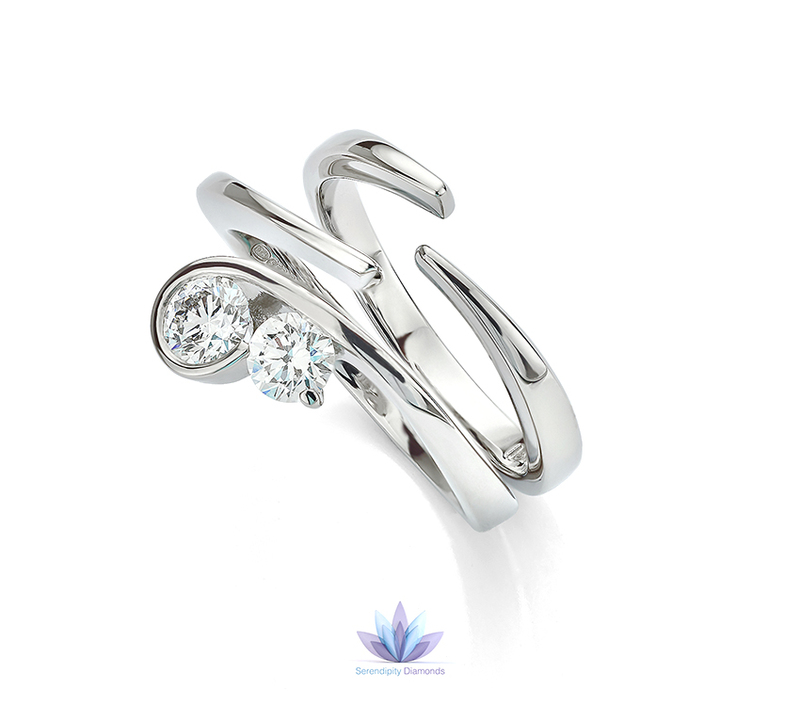 Showing the split band wedding ring, fitted to the ‘flow’ engagement ring by bespoke design. Before your wedding, apply a small amount of hand cream to the ring finger ahead of the ceremony. This will moisturise the finger and allow the ring to glide onto the hand, far easier than without. There are several different temporary solutions for making rings tighter. Snuggies offer a flexible plastic wrap around the band. We don’t recommend metal ring clips. Hard metal ring clips often scratch precious metal when removed or when fitted. We recommend a conversation before making any decision. Ideally, we recommend clients visit us. During an in-depth appointment, we discuss your personal situation and make sensible suggestions. Many of our clients suffer from large knuckles and we work very hard to provide the best solution for the best fitting wedding ring possible. In recent months, some of our new clients, unfortunately, had wedding rings cut off their hand. Owing to swollen hands, or accidents, the wedding rings could not be removed. As a result, they had to be cut. For this reason, we added to our original article with some further help. If your ring has to be cut off, ask the person cutting the ring to be sympathetic. Explain the ring will need to be repaired. If your ring cannot be repaired, it can be re-made. 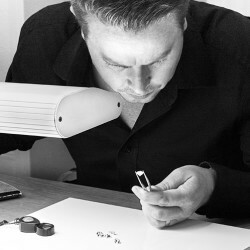 We regularly re-make original wedding rings working to the same design. The commission below shows the original ring with the new ring alongside. We can even use your original gold, adding more metal where necessary.